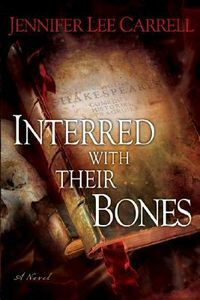 Interred With Their Bones by Jennifer Lee Carrell: Synopsis and Online Purchase Options. Synopsis (from the publisher): On the eve of the Globe's production of Hamlet, Shakespeare scholar and theater director Kate Stanley's eccentric mentor Rosalind Howard gives her a mysterious box, claiming to have made a groundbreaking discovery. But before she can reveal it to Kate, the Globe burns to the ground and Roz is found dead … murdered precisely in the manner of Hamlet's father. Inside the box Kate finds the first piece in a Shakespearean puzzle, setting her on a deadly, high-stakes treasure hunt. From London to Harvard to the American West, Kate races to evade a killer and decipher a tantalizing string of clues, hidden in the words of Shakespeare, that may unlock literary history's greatest secret.